Generic Packaged Feminine Pads , manufactured by Hospeco, are sanitary napkins for use during a menstrual cycle. Available in a wide variety, these Maxi Pads are certain to meet your menstrual needs. 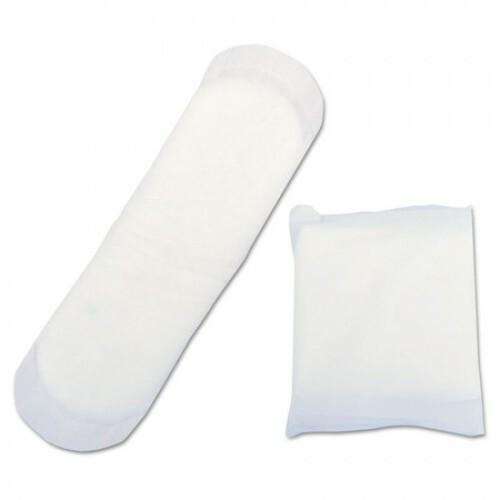 In fact, sanitary napkins are available with multi-channels or wings to accommodate even heavy cycles. Individually wrapped, you can easily carry these feminine pads when you're traveling. Furthermore, the packaging keeps each pad sanitary, so you can feel confident with each unwrapping. Order now and see why so many women feel confident with these Maxi Pads today! Packaged in plain white packaging. Various styles to accommodate different needs. Product Numbers: 250IM, BULK576, 00310, 00816B, and HS-1005/12. Application: To assist women during their menstrual cycle.